Welcome to our first issue of the new year. We have policy updates for you – the NTAexplains proposals to replace Models of careon page 10; new resources – Alcohol Concern introduces new outcome measures for alcohol services on page 11; and a fresh look at local treatment services versus out-of-area provision on page 14. John Ryan gives insight into his experiences working with harm reduction in Australia (page 12), while Brendan Georgeson gives a motivational account of organising Bristol’s first dual diagnosis recovery conference. And we’re pleased to welcome Release’s first legal column, as Niamh Eastwood explains the complicated landscape of welfare reforms. Niamh will be among the speakers at our DDN/Alliance service user involvement conference in Birmingham on 10 February – our fourth annual event, can you believe? The DDN team will be there, and we hope to see you. The debates this year will be more crucial than ever. In the tradition of the new year, our cover story offers a motivational outlook that’s based on common sense and practical self audit, which we hope will be useful to pass on to clients as well as spurring you on in the current climate. The article might not be everyone’s cup of tea – you only have to see the letters on page 8 to realise that one person’s motivator is another’s irritant – but we hope the simple steps to empowerment offer inspiration for re-engaging clients in all kinds of situations. And talking of change, after much deliberation, we have decided to change your fortnightly magazine to a monthly frequency – so we’ll be out on the first Monday of every month, starting on 7 February. We read your survey responses, looked at the transition of much of our print advertising to online, and decided to adapt our format. We’ll be enhancing the magazine and website, bringing you everything you need to keep you up to date and informed. 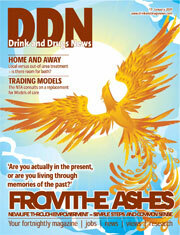 The most important thing to us is that DDNremains free of charge to our much-valued readers.